Every year, I somehow manage to forget how pasty, “winter”-colored legs look when you slip into my first summer sun dress. This was my dilemma as I was putting together an outfit for a baby shower on Saturday morning. The adorable hot pink shift I picked was begging for some glowing gams, but I didn’t have time to get a spray tan. 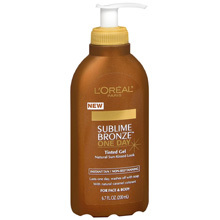 Enter Loreal’s new Sublime Bronze One Day tinted gel, ($8.09, walgreens.com)! This instant tanning gel pumps into your palm as a rather intimidating deep bronze glaze, but the color evens out quickly once you rub it into your skin. I loved that this one didn’t have that tell-tale tanner smell because it’s DHA free. I applied an even coat over my legs, arms and chest and waited for it to dry. (about 10 minutes, just to be safe). Then, for good measure, I scrubbed my hands with soap and a loofah to avoid the home tan golden-palm look. Sure enough the product left a subtle, but very noticeable glow, successfully transforming me from “January” to “June”! You can apply multiple layers of the gel for a deeper effect, but I didn’t find the coverage to be as good at evening skin tone out as I find with real sunless-tanning products. All in all, this is a great product to have on hand between other self-tanning treatments, especially if you’re as short on time as you are on tan! NOTICE: None of the celebrities or individuals discussed here have ever received treatment, surgery, medical advice, or evaluations from any author, physician, surgeon, or representative of this blog. All images and photos in this article represent models only. No actual patients or clients are shown. 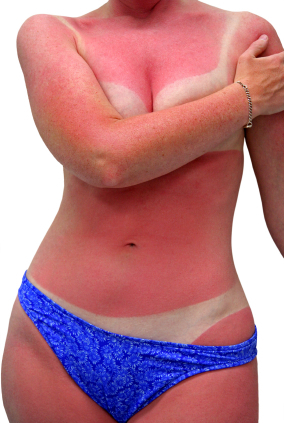 Did Memorial Day leave you looking like a lobster? Sunburns happen when UV light kills the layer of new cells just below your skin’s surface. Your immune system responds by sending healing fluid to the burn (the swelling and redness you see), while your nerves release pain messages to your brain to let it know that your skin is “well done”. The only cure for a sunburn is time, but here are 4 soothing “C’s” to put out the flame while you’re waiting. The month of May makes Fighting Fine Lines even more meaningful since it’s National Skin Cancer Awareness Month. 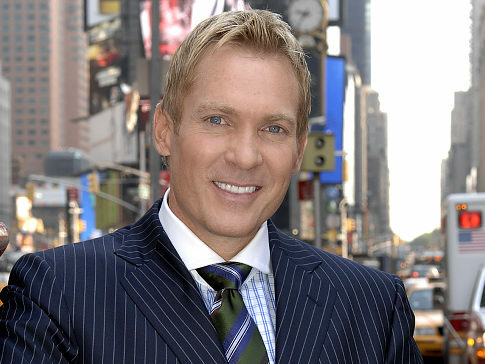 We were impressed to see ABC News’ Weather Anchor, Sam Champion undergo his fifth skin cancer surgery live on Good Morning America earlier last week. An average of 1 in 5 of us will develop skin cancer in our lifetimes, so read on for some quick tips on prevention, detection, and treatment. Click here to become a Fan today! Enter your email address here to subscribe to FFL and receive notifications of new posts by email.. The Breast "Blaug" Breast Implants and Aesthetic Breast Surgery. Enter your email address to subscribe to FFL and receive notifications of new posts by email. © FightFineLines.com, 2010-2012 Unauthorized use and/or duplication of this material without express and written permission from this blog’s author and/or owner is strictly prohibited. Excerpts and links may be used, provided that full and clear credit is given to FightFineLines.com with appropriate and specific direction to the original content.